Devi (Chennai, India) on 30 March 2014 in Plant & Nature and Portfolio. But as I became more mature i could see and feel His enlightenment..I understood Him. so much violence every where. Hope brotherhood and love encompasses the whole world. Beautiful stunning picture,the birds are the branches to sleep, beautiful blue skies!:-))Haleja. Happy Sunday,my good friend Devi! Quelle concentration d'oiseaux sur ces branches quelle vue sueprbe compo. Awesome, excellent backligt and a beautiful view with silhouettes of birds, great shot, I like a lot. @Gerard1948: Thank you Gerard...I appreciate :))))))))))))))))))))))))))))))Have a great day..
A fine catch of these birds roosting for the night. Nice shot. So many birds perched on the branches! Wonderful atmosphere! 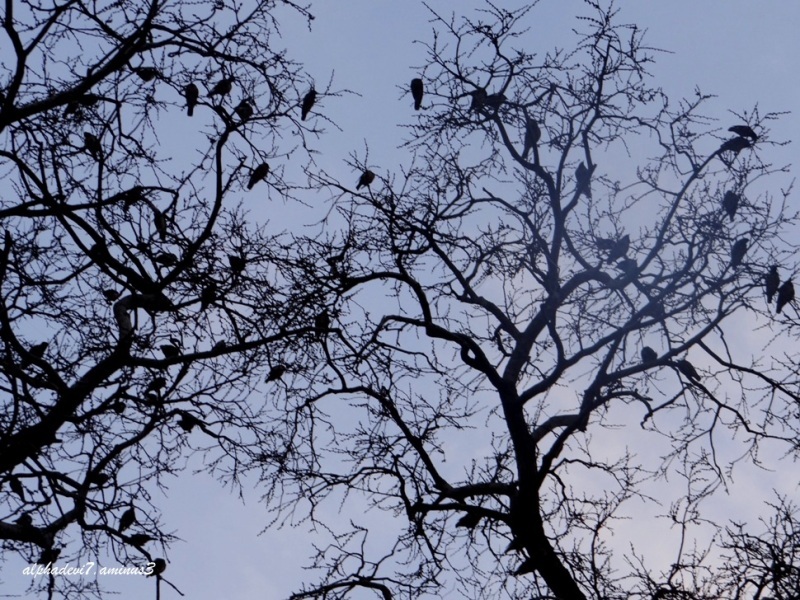 A most beautiful image with the patterns of the trees and the birds perching. Wonderful capture of the tree and birds returning home for the night. Very interesting words about Buddha and Enlightenment, Devi. @Sam: Thank you Sam :) I used to feel that the Prince Siddhartha frittered away a good chance of alleviating the sufferings of the people, as a wonderful compassionate king.l.Well...it was His way of life and one marvels at the quitting of luxurious living and seeking monk hood!! yeah they are lot of them modeling for you... ;-), wonderful capture Devi.., If I am not wrong you will be posting nice Ugadi Pickle tomorrow.